King Arthur Flour, one of the two dining options located in Baker-Berry Library, has been forced to change its operating hours, due to understaffing. Whereas KAF used to operate from 8 a.m to 6 p.m. every day of the week, it now only opens from 8 a.m. to 5 p.m., Monday through Friday. Tunnicliffe said that in order to alleviate the problem, KAF was attempting to hire more employees because the company would prefer to return to its original operating hours. However, he added that the current unemployment rate across Vermont and New Hampshire — which is less than three percent — has created a very tight job market in the Upper Valley, which has an even lower unemployment rate than that of either state. The store’s second window currently has a sign announcing that it is hiring new workers. Tunnicliffe said that evaluating KAF’s menu is always on the company’s agenda, which might mean adding or removing certain products. He added that seasonal changes usually lead to the addition of new products and that the company would be looking at adding new seasonal items in the fall term. While students may have reduced access to KAF, they will soon be able to track the length of the KAF line. Eshin Jolly, a sixth-year Ph.D. student in the psychological and brain sciences department, and Jin Hyun Cheong, a third-year Ph.D. student in the PBS department, have developed a mobile application in conjunction with a Digital Arts, Leadership and Innovation Lab team that will monitor the line at KAF. The application will allow people to check the approximate wait time at KAF. Jolly said that the project took root at a hackathon event nearly two years ago, as his group wanted to know the best times to go to KAF, due to the ever-fluctuating nature of KAF’s line. According to Jolly, collaboration with DALI has improved the time estimates that the application provides. “The goal here is to provide the Dartmouth community with some information about the estimated wait time for KAF on a regular basis throughout the day, and also to just try and provide some predictions about how that wait time changes over the period of the week and maybe over the term as well,” Jolly said. According to Jolly, a closed test-run beta program for the application is currently under way in conjunction with DALI Lab. Jolly added that the beta would provide the team with an opportunity to implement improvements based on community feedback before the application officially launches sometime in the fall term. Furthermore, Jolly said that once the team gets a sense of how the Dartmouth community is using the application, team members will look into working more closely with KAF to improve the functionality of the application by adding more features, such as displaying item availability. KAF operates independently from Dartmouth Dining Services, the company that controls the rest of the College’s dining options. According to DDS director Jon Plodzik, DDS’s relationship with KAF is purely transactional. He added that he is uncertain of how exactly DDS’s finances have been impacted by KAF’s change in operating hours. However, Plodzik said that DDS is also feeling the effects of the tight job market in the Upper Valley. DDS director of financial operations and marketing Matthew Smith said he has seen the largest ever amount of financial transactions at DDS locations this spring term. Furthermore, he noted that there has been an increase in transactions at College dining establishments that might be viewed as alternatives to KAF, such as Novack Cafe and House Center A’s snack bar. However, Smith noted that this increase in transactions at alternate locations has been consistent throughout the day and does not necessarily only occur during the hours when KAF is not open. 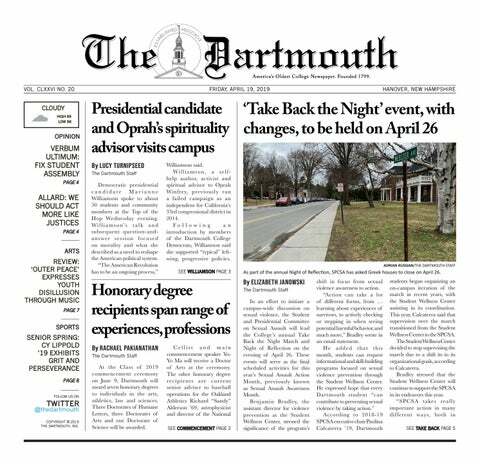 He added that since this term has the highest number of students enrolled at Dartmouth that he has experienced in his seven years at the College, he is unsure if the increase is due to the changing of KAF’s operating hours or the surge in the number of students on campus.